From our previous blog posts you already know that upcoming Rebelle 2 will feature many useful additions such as stencils, masking tools, selections, PSD support, faster save & undo functions and more. Today we’d like to introduce other improvements that you can expect in the upcoming version - completely redesigned brush engine. What you (and we) missed in the first Rebelle version were without a doubt more brush options - shapes, pressure settings, textures, ability to create custom brushes and so on. These possibilities are available in every good painting software and we absolutely understood your desire for more control over the brushes. However because of Rebelle’s sophisticated watercolor simulation this was a huge and quite a complicated task - for this purpose we have been redesigning the whole brush system for the past year and are proud to announce that Rebelle 2 will feature new brush engine that will push your painting process to new creative heights. From Rebelle 2 users will be able to create custom brushes via Brush Creator panel where you can choose from various brush shapes and grains. Amazing addition that will help you create unforgettable artworks are many new brush shapes - flat, bamboo, triangle, hexagon, square, star, sponge… you name it! There are many default brush shapes and grains implemented directly to Rebelle but you can easily add your own. Many of you asked us to implement pressure support that influences the size of the brush. Drumroll, please - your prayers have been heard! In Brush Creator panel you can set the influence of the pen pressure on brush size and opacity and create nice tapered brush strokes. 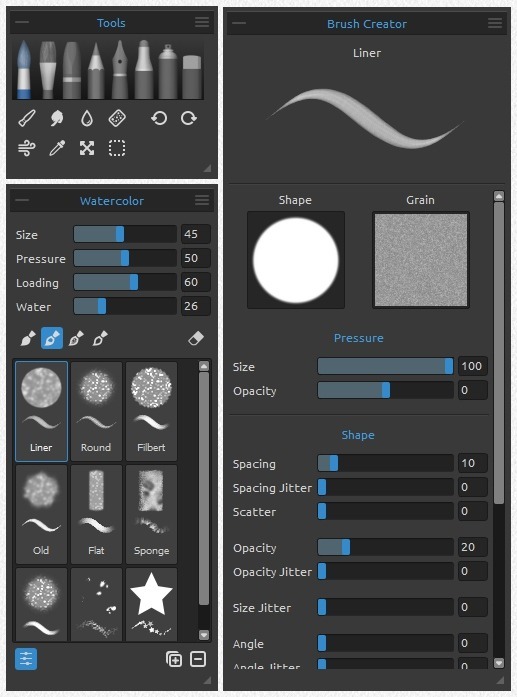 Brush creator enables you to set many different shape and grain settings including spacing, jitter, scatter, angle or scale. You can also set whether the brush should follow the rotation on canvas or not - this is especially handy when working with flat brushes. 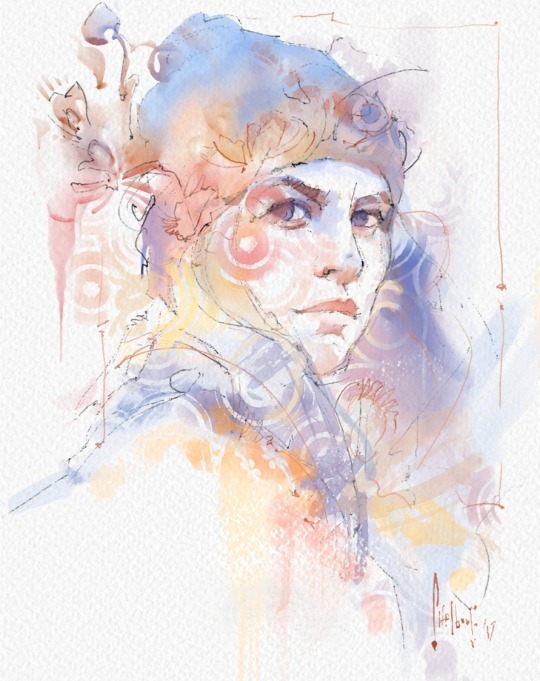 In the first Rebelle version our main focus was to create the most natural watercolors. It is a real challenge to simulate watercolor behaviour in a digital form, because it has many nouances and subtle details which makes it so specific. In the second Rebelle version we made watercolors even more creative, but also focused on other tools, especially acrylics which got an extraordinary realistic look. Basic settings for brushes in the Brush panel are coupled with other new improvements - you can name your brushes by double-clicking on the brush name or change the order of brushes as well as duplicate, remove and reset the brush preset to default values. Rebelle 2 also comes with the possibility to import, export and share your own brush presets directly from the user interface. What’s more is that now every brush can be used as an eraser. Such brush works as an eraser but a bit differently - it removes the paint from the canvas based on the brush settings just like in the world of traditional art when a clean brush is used for removing abundant mass. In this new version it will be possible to change the size of the brush directly on the canvas with quick shortcuts. Use Ctrl or Cmd + left mouse button and drag to the right to increase, to the left to decrease the brush size. In Rebelle 2 we included a setting to switch to -yet- experimental version where brushes run on our new GPU engine. The main reason we are developing such engine is to secure that Rebelle 2 will handle large resolution with larger brushes. It is still in development, but if you have a dedicated graphic card you can set Rebelle to run on GPU from Preferences Panel. This engine is still unstable and may crash unexpectedly, because it is for now only experimental. We would like to release fully featured GPU engine in one of the next Rebelle 2 free updates. 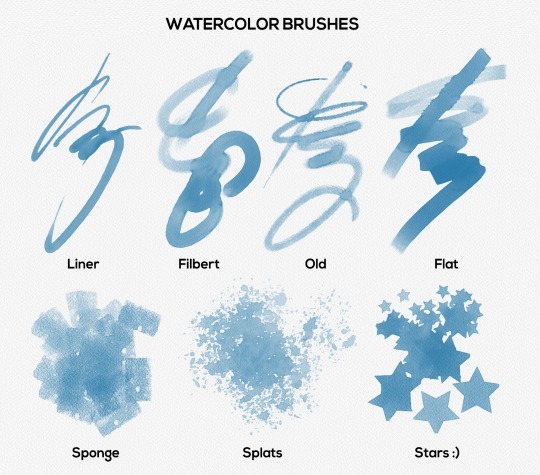 The new Rebelle version brings new possibilities for Water and Dry tools - you can create nice splatters and wet effects, since these brushes can have various shapes and textures. Rebelle 2 will be available on our website from April 25th 2017 for the full price $89.99. All existing owners of Rebelle are eligible for more than 50% discount - regular upgrade price will be $39.99. Users who purchased Rebelle within last month, from March 25th 2017 will pay only the price difference between versions, which is $29.99. On April 25th, we will send out newsletters with more information on how to upgrade - definitely check your Inbox and Spam folder, so you won’t miss it! Minimum: Intel i3 or equivalent AMD processor, 4GB RAM, 100MB hard disk space, graphics card with 1GB RAM, Windows Vista (64-bit or 32-bit) or Mac OS X 10.8. Recommended: Intel i7 or equivalent AMD processor, 16GB RAM, 100MB hard disk space, graphics card with 4GB RAM, 64-bit system Windows 7, 8, 10 or Mac OS X 10.9 and newer, Wacom or Surface compatible tablet. With Rebelle 2 the revolution in digital painting continues. We believe it is a huge step forward to a new way of enjoying traditional methods in the world of digital art. We are now preparing even more features for the upcoming 2.x updates, which all will be free for Rebelle 2 users.